There comes a point in most watch owner's lives, whether it be a price point or a moment in time, where the next watch you add to the collection is purchased with more of your heart than your head. Many of us form unexplainable emotional connections with these small, handmade mechanical pieces of artwork and for many people, nothing makes a watch more special than it being made in a significant year for the new lucky owner. This almost unavoidable emotion is something David has harnessed when selling his Rolex watches through the iconic store Vintage Watch Company (VWC) also known as 'the birth year Rolex shop in London'. 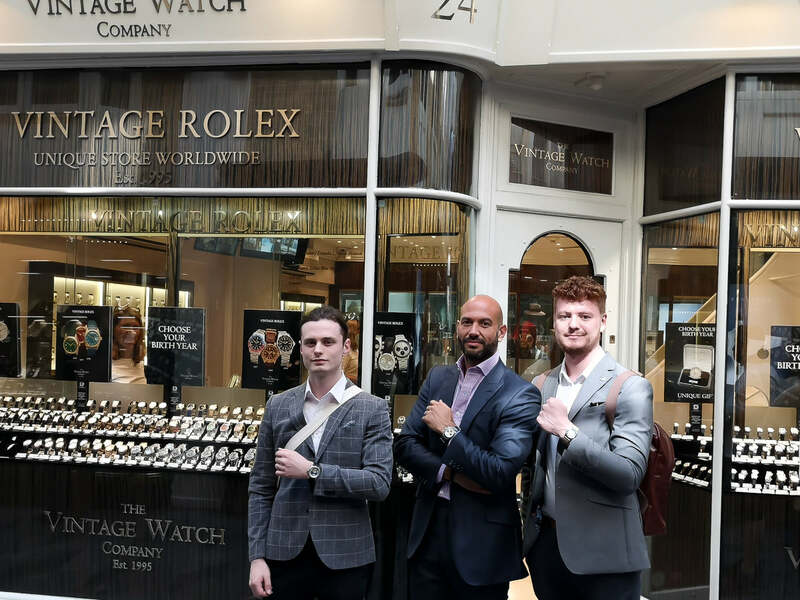 Following in his father's footsteps, David Silver has been successfully bringing special vintage Rolex models to his loyal customers in the heart of London’s watch scene for the past 15 years. 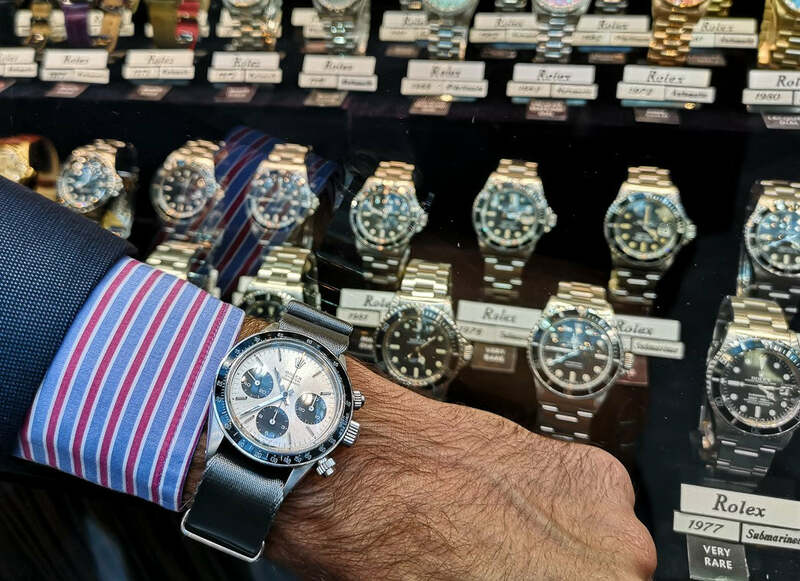 David and his store offer customers a personal, memorial experience resulting in them walking away with not just a superior vintage Rolex watch, but also a Rolex that has heightened significance to the new owner. In VWC case, birth year watches. 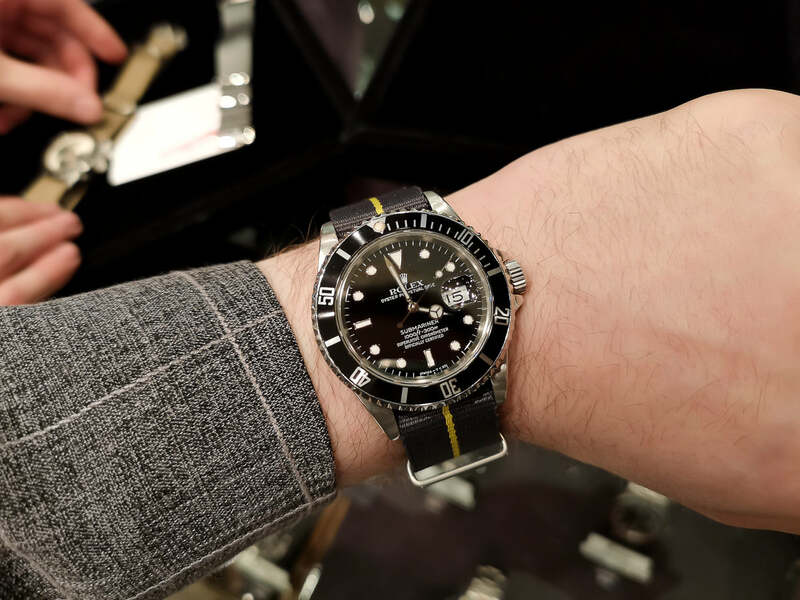 In one of our most recent visits to London, we stopped off at the iconic Burlington Arcade to catch up with David and talk all things watches, both his passion with Rolex and ours with straps. After a stroll past VWC’s window, you get a sense of the huge range of models David has to offer. Every reference number you could ever dream of is right there including personal favourites such as 1601, 1016, 6234 and 6542. 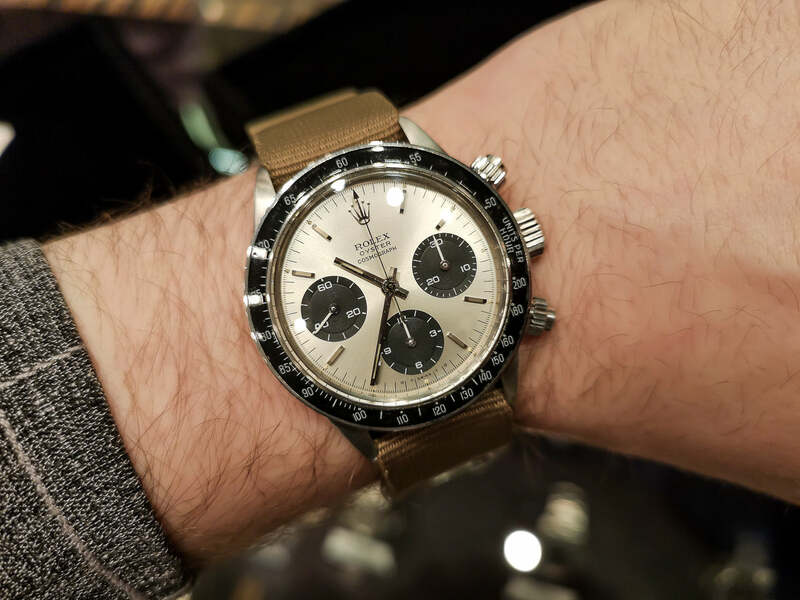 The first watch to get a strap switch-up was a Rolex Cosmograph Daytona. This reference has a stunning silvery champagne coloured sunburst dial with a jet black telemeter. 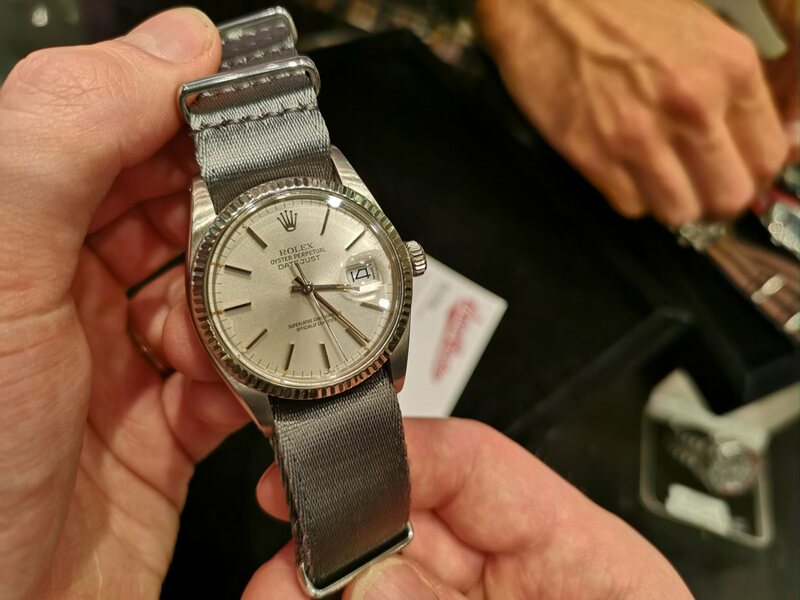 In typical vintage Rolex style, it comes in at 37.5mm making for an incredible wearer on the wrist. The caramel tones was a feature of the watch we wanted to bring out more which is why the first strap we fit this Daytona to was our Lightweight ZULU Nylon strap in the Desert Sand colour. The colour of this strap was perfect for matching the tones of the Daytona's dial, yet it was the ZULU keepers I found which topped off this look. The ZULU hardware acts as a reminder for the Daytona of its’s core tool watch DNA, before the luxury side of the watch was elevated to the stage it’s at now, before the Rainbow Daytona of this years Basel, and before the price tag was in the tens of thousands! 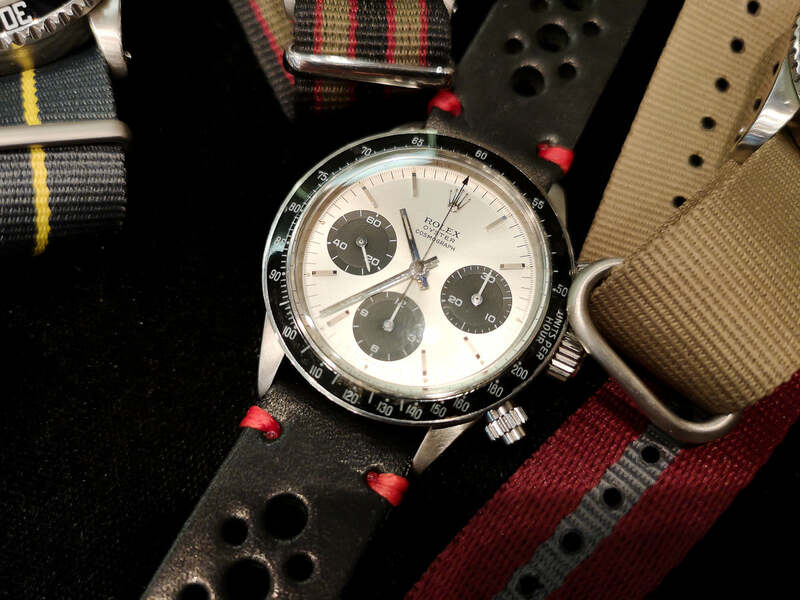 The watch also looked great on one of our Vintage Racing straps. A black vintage racing was fitted with red stitching adding a pop of colour and complemented the black bezel. As soon as this strap was fitted I immediately imagined it on the wrist of an owner of a classic Ferrari 250 GTO matching the exterior red with the stitching of the strap and the interior of the classic with the strap. Sticking with Daytona's for a moment we then got our hands on another Rolex Cosmograph Daytona reference 6263. 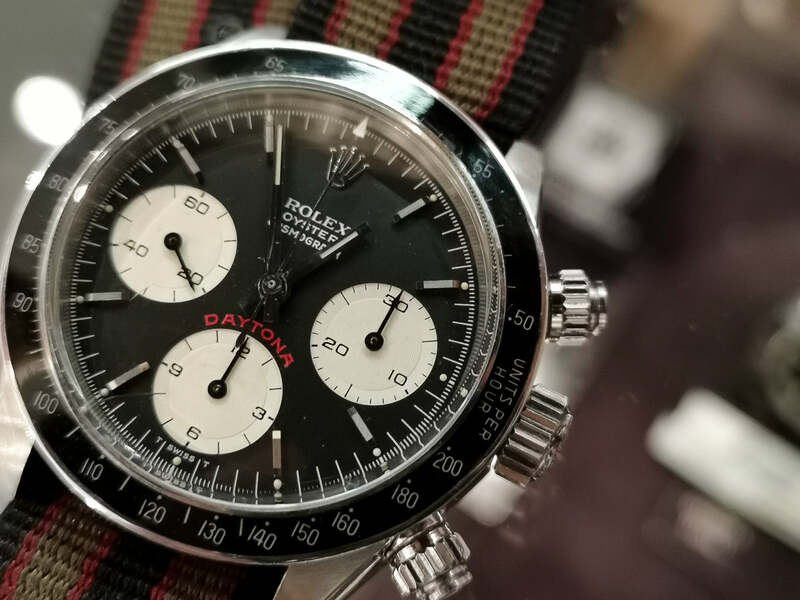 This panda dial Daytona still features the black bezel but now has the renowned 'Daytona' on the dial in a red font colour. When picking a strap for this classic, we really wanted to pick up on that red font which is why the subtle red stripe in our Vintage Bond felt like the perfect strap. Admittedly the Daytona hasn't been a James Bond watch, but if it had, after seeing this combo this would definitively be the reference number and model he would have gone for. 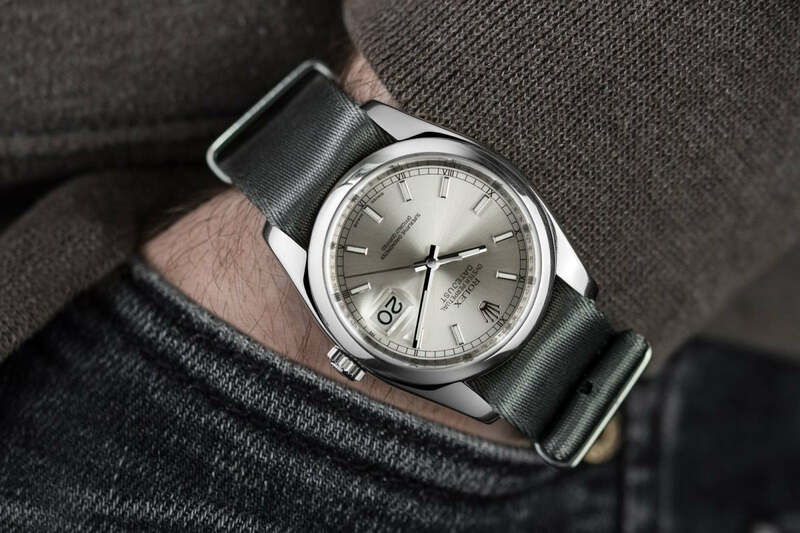 In our experience, matching straps to a silver dial Datejust that are not leather straps can be quite difficult, however, once one of our new Grey Iridescent Herringbone NATO straps was fitted to this 1601 all our worries disappeared. I love the versatility of these 1601's as they make for such an incredible everyday watch. This specific model has some incredible custard colour lume plots, a nice touch making a popular watch more unique. This is why the Iridescent NATO works so well. For everyday wear, especially in warmer climates, this is such a strong option. We liked this combo so much we recreated the look with Ben's modern-day Datejust! Next up, a Submariner. A watch that is close to my heart, it’s a hard task to try and find a strap this watch doesn’t look good on. Which is why we decided that the Marine Nationale in Gunmetal Grey with a yellow stripe was the one. This combo really gives the Sub that military, tactile, rough and ready look. Much like the Datejust pairing, the Sub on a NATO makes for such a combo that is ideal for the warmer months. When handling vintage Subs I'm always amazed that over the years the watch has barely changed. Possibly excluding the newer models with their beefed up cases, just looking at images of Submariners it can be pretty hard to determine which generation it's from. My favourite feature on this Sub was the lume pip on the bezel and it's wonderfully patina-ed colour. 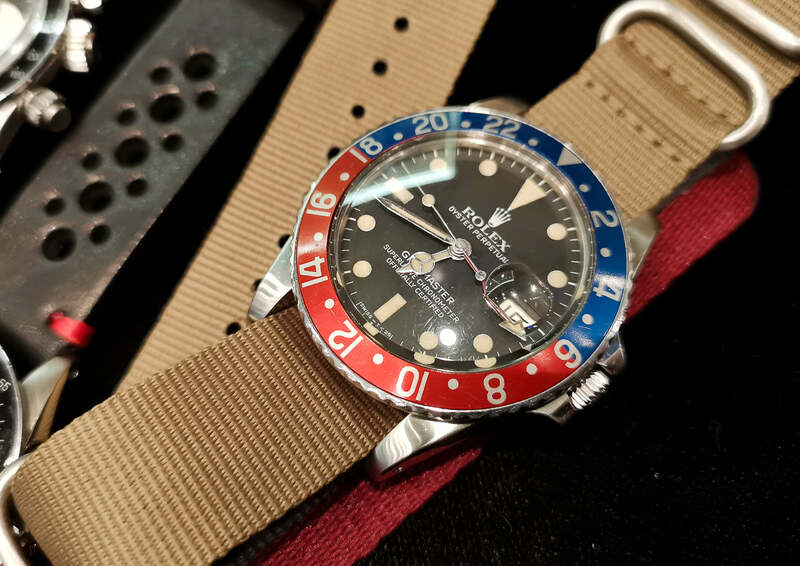 Last but not least we have a vintage Rolex GMT Master back on that Desert Sand Lightweight ZULU Nylon strap we saw earlier. Much like the dial on the Cosmograph Daytona, this strap works so well on the GMT because of the range of unique colours we see on the dial. In my opinion, this is a perfect amount of patina. The tritium lume is such a strong warm colour and for me, an ideal amount of ageing has happened where it's visually unique but it's not too far gone as to where you can't add to it yourself. David's go-to combo fitted to our Iridescent NATO of course! So, it's fair to say after thanking and saying goodbye to David, Ben and I had thoroughly enjoyed our afternoon. I think the main takeaway was how powerful a simple strap change can be. This is something I've recently talked about in a video on our channel, but it never ceases to amaze me how different a watch can look with a new strap. I'd like to of course thank David from VWC for his time and showing us some important Rolex models. If you're ever in the Mayfair area of London, take the time to wander down to Burlington Arcade and stop off at Vintage Watch Company to see David and his incredible watches. Don't forget to mention WatchGecko sent you as well!